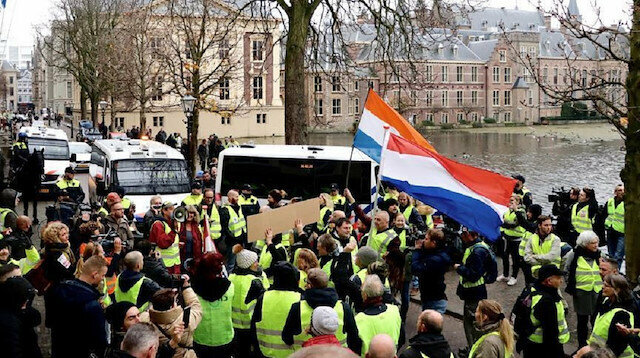 The "yellow vest" protests spread to the Netherlands on Saturday as people staged anti-government protests in various cities. Responding to calls on social media, the protesters took to the streets in the cities of The Hague, Nijmegen, Maastricht, Alkmaar, Leeuwarden and Groningen. Some 200 protesters demonstrated in front of the parliament building in The Hague. Following police action some protesters left the venue while others demanded that they be let to walk around the parliament building. Some of them removed their yellow vests upon calls from the police. The 'yellow vest' protests first started in France two weeks ago against a rise in fuel prices. On Friday, they also spread to Belgium. The unemployment rate in the EU was 6.7 percent in October, according to official data released on Friday.Eurostat said last month the EU saw the lowest level in unemployment rate since January 2000.On a monthly basis, the EU28 unemployment rate remained same, as the figure fell 0.7 percentage point compared to 7.4 percent in October, 2017. "The euro area [EA19] seasonally-adjusted unemployment rate was 8.1 percent in October 2018, stable compared with September 2018 and down from 8.8 percent in October 2017," the statistical office said. "This remains the lowest rate recorded in the euro area since November 2008. "The eurozone/euro area or EA19 represents member states that use the single currency -- euro -- while the EU28 includes all member countries of the bloc.As of October, some 16.6 million men and women in the EU28 -- of whom nearly 13.2 million in the euro area -- were unemployed, according to the Eurostat estimation. "Compared with September 2018, the number of persons unemployed decreased by 4,000 in the EU28 and increased by 12,000 in the euro area. "Compared with October 2017, unemployment fell by 1.52 million in the EU28 and by 1.12 million in the euro area," Eurostat said.The highest unemployment rates were in Greece with 18.9 percent -- August figures --, and Spain with 14.8 percent, while the lowest rates were in Czech Republic with 2.2 percent and Germany with 3.3 percent.Official figures revealed that nearly 3.5 million young people -- aged under 25 -- were unemployed in the EU, of whom 2.503 million were in the euro area. "In October 2018, the youth unemployment rate was 15.3 percent in the EU28 and 17.3 percent in the euro area, compared with 16.3 percent and 18.1 percent respectively in October 2017. "In October 2018, the lowest rates were observed in Czechia [5.2 percent], Germany [6.2] and the Netherlands [7.2], while the highest were recorded in Greece [36.8 percent in August], Spain [34.9] and Italy [32.5]," Eurostat added. Anglo-Dutch consumer goods company Unilever said its CEO Paul Polman was retiring, less than two months after a damaging row with shareholders, and would be replaced by the head of its beauty unit Alan Jope from January 1.Polman's exit comes after the maker of Dove soap and Ben & Jerry's ice cream was forced to scrap a plan to move the company headquarters to the Netherlands in October, following a shareholder revolt.Unilever said that Jope, 54, the boss of its largest division, had been appointed after "a rigorous and wide-ranging selection process". Polman would stay on for six months to support Jope's transition into the role, the company added.Polman has been at the helm of Unilever for 10 years, generating big returns for shareholders and fighting off a $143 billion takeover approach by Kraft-Heinz in 2017.He said he was confident the company would prosper under Jope. "His (Jope's) appointment demonstrates the strength of Unilever's succession planning and talent pipeline," Polman said in Unilever's statement on Thursday.